A drug is described as a substance that has the ability to modify the way that the body and mind function on a psychological or physical level when it is administered. Something as simple as a cup of caffeinated coffee is actually considered a psychoactive drug since it has effects when it is consumed. A psychoactive drug affects the central nervous system and can alter a person’s train of thought as well as their mood and personality. Hallucinogens: These types of drugs such as ketamine, LSD, and mushrooms, alter people’s feelings and perception of what is happening. They can cause panic in those who are not used to the feeling of this type of high and can cause paranoia as well. Stimulants: Drugs such as cocaine, caffeine, and amphetamines (legally prescribed medications), increase the activity in the brain and can arouse the body. Cocaine: Cocaine is a stimulant drug that can reduce tiredness and increase attention span. It is derived from the coca plant which is typically grown in a number of South American countries. 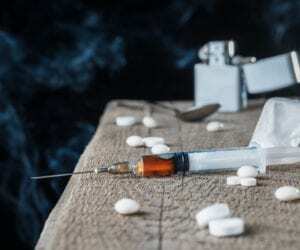 Heroin: This depressant drug increases heart rate and can be deadly when taken in large quantities. The drug is derived from the poppy plant and is first refined into opium then further refined into morphine, and then made into heroin. It is typically taken by injection or smoking. Crack: Crack is a variation of cocaine. It differs from regular, ‘pure’ cocaine in that ammonia is typically added to the formula in order to enhance the potency. The name ‘crack’ came from the sound that the drug makes when it is smoked or heated. Opioids: Opioids are a type of drug that comes in an illegal version and a legal version. The illegal version is drugs such as heroin and synthetic opioids like fentanyl while the legal version includes drugs such as codeine and hydrocodone; medically-prescribed painkillers. Opioids are highly addictive and should not be taken without a medical prescription. Far too often, drugs are misused and abused, causing people to become dependent and addicted to them. The key to avoiding this is to only take medications when they are prescribed for you and avoid illegal substances altogether. When you abuse drugs, you are running the chance to become dependent on them or experiencing dangerous side effects. You also run the chance of an overdose as the drugs these days are laced with very harmful and life-threatening additives. In order to know if a loved one is misusing drugs, be sure to take note of their mood and their behavior. If their mood is completely different and they are exuding personality changes, it may indicate a drug problem. Take a look at their speech and see if it is slow and slurred. If they seem disoriented and somewhat drowsy, it may indicate that they are under the influence of illegal substances. Opioid misuse is officially a nationwide epidemic. If you or someone close to you is struggling with an addiction to opioids, there is help available.